We started making smoothies in 1999. On that first day we sold twenty-four bottles, and now we sell over 2 million a week, so we've grown since then. This book is about the stuff we've learned since selling those first few smoothies. About having ideas and making drinks, about running a business and getting started, about nature and fruit, about company life and working with friends, about the stuff we've got right and the stuff we got wrong, and about squirrels . . . and camping . . . and doing the right thing. We thought we'd write it all down in a book so we don't forget any of it, and to maybe help other people too. 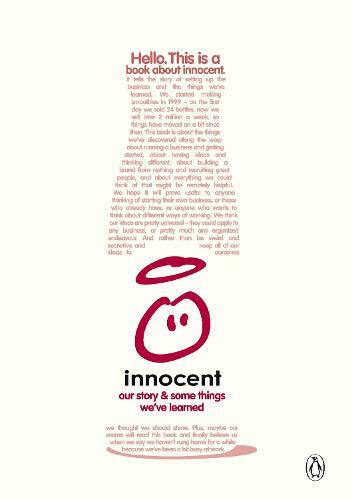 We started innocent from scratch, so we've learnt a lot of things by getting stuff wrong. Some other lessons have come from listening carefully to people clever than us. And some stuff we just got lucky on. But all of it, the good the bad and the useful, is in here. Plus, perhaps our mums will finally believe us when we tell them we haven't rung home for a while because we've been a bit busy these past few years.